“……The 2019 U.N. World Water Development Report said that while safe, clean drinking water and sanitation are human rights, the world is not on track to provide those things to everyone by 2030. Gaza: A shortage of potable water for drinking, cooking, and hygiene with a lack of wastewater sanitation. The main source of Gaza’s water, its aquifer, is being depleted and its quality diminished by seawater intrusion, wastewater seepage, and agricultural runoff. An unusually persistent harmful algal bloom (red tide) is currently affecting portions of the southwest coast of Florida. For the latest updates on this event, visit the Florida Fish and Wildlife Conservation Commission red tide status website or the NOAA Harmful Algal Bloom Bulletin. How long will this red tide last? If and when bloom the current bloom will end remains an open-ended question. Red tides can last as little as a few weeks or longer than a year. They can even subside and then reoccur. In 2005, for example, a bloom started off the coast of St. Petersburg, Florida, in January and then spread from there to Pensacola and Naples by October, persisting for the majority of the year. The duration of a bloom in nearshore Florida waters depends on physical and biological conditions that influence its growth and persistence, including sunlight, nutrients, and salinity, as well as the speed and direction of wind and water currents. Researchers are watching oceanographic conditions in the region carefully and using forecasting tools similar to seasonal weather forecasts to predict how long this bloom will last. NOAA issues twice weekly forecasts to monitor bloom conditions during a harmful algal bloom event. What is NOAA’s role in responding to this red tide event? NOAA conducts scientific research and provides forecasts to give communities advance warnings to better deal with the adverse environmental impacts, health effects and economic losses associated with red tide and other harmful algal bloom events. NOAA monitors conditions year round and provides official forecasts for red tide through two main products: conditions reports and bulletins. 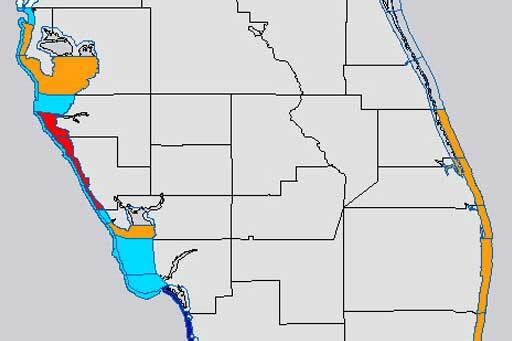 The conditions report identifies if red tide cell concentrations are present and provides forecasts of the highest potential level of respiratory irritation over the next three to four days. Bulletins provide decision-makers with a more in-depth analysis of the location of a current bloom and reported impacts, as well as forecasts of potential development, intensification, transport, and associated impacts of blooms. Both products are updated twice weekly during a bloom. In addition, NOAA and a network of trained and authorized professionals from state and local organizations work together to respond to stranded marine animals found along the coastline during these events. Can this red tide event be stopped? There are currently no means of controlling the occurrence of red tide. The Florida red tide organism, Karenia brevis, produces potent neurotoxins, called brevetoxins, that can affect the central nervous system of many animals, causing them to die. That is why red tides are often associated with fish kills. Mortalities of other species, including manatees, dolphins, sea turtles, and birds also occur. Red tide toxins can also accumulate in filter-feeders mollusks such as oysters and clams, which can lead to Neurotoxic Shellfish Poisoning (NSP) in people who consume contaminated shellfish. While not fatal, NSP causes diarrhea and discomfort for about three days. Rigorous state monitoring of cells and toxins is conducted to close commercial shellfish harvesting if necessary to protect human health. Recreational shellfish harvesters should check State web pages to make sure it is safe to consume shellfish. Is it still safe to go to the beach? Some areas may be more affected than others. Check NOAA forecasts to assist in locating unaffected areas, and learn more about red tide health concerns from Florida Health. Timing: Blooms of this alga typically start in late summer or early fall. The last large early summer bloom was in 2005. The current bloom started last fall and is still going. Duration: While not unprecedented in its duration, this bloom is unusually persistent. It started in October 2017 and continued through spring of 2018. By early summer, the bloom resurged and was detected in five southwest Florida counties. Some shellfish harvesting areas have been closed since November 2017. Size: The size of the bloom changes from week to week, and it is patchy. Not every beach is affected every day, so it is important to stay up to date with the NOAA conditions report. As of August 15, the bloom stretched from Pinellas County to Collier County, more than 150 miles. While the timing, duration, and size of this red tide are unusual, red tides are not new to the Gulf Coast. Red tides were documented in the southern Gulf of Mexico as far back as the 1700s and along Florida’s Gulf coast in the 1840s. Fish kills near Tampa Bay were even mentioned in the records of Spanish explorers. For more information on historical red tide events in Florida, see the Florida Fish and Wildlife Conservation Commission’s harmful algal bloom monitoring database. What do you do if you see sick, injured, stranded, or dead wildlife? If you see sick, injured, or stranded wildlife, such as a sea turtle, manatee, dolphin, seabird, or a large fish kill in Florida, report it to the following standing network hotlines. To report an injured, hooked, entangled, or stranded sea turtle, call 1-877-942-5343. To report other sick or injured wildlife and fish kills, contact FWC Wildlife Alert or call 888-404-FWCC (888-404-3922). If you see dead or injured marine mammals, call 1-877-WHALE HELP (1-877-942-5343). You can also report via the Dolphin and Whale 911 Phone App. What is the projected effect of this red tide on marine life? How long will it take for impacted marine life to recover? There is no way to project the cumulative effects of this red tide event. Red tide occurs naturally in coastal waters of the Gulf of Mexico with blooms appearing seasonally. Although the Florida red tide organism, Karenia brevis, typically blooms between August and December, blooms often deviate from that time frame. The current bloom continues to be monitored by our local and state partners. Visit the Florida Fish and Wildlife Conservation Commission’s (FWC) red tide status page. Reports of fish kills and marine animal deaths are made publicly available on FWC’s website. For more information on the effects of red tide on marine animals, shellfish, and people, visit our health information page for more information. Can NOAA provide travel advice for people planning to visit this region? While NOAA provides regional harmful algal bloom forecasts and supports research to better understand the causes, impacts, and effects of these events, we are not in a position to provide travel advice. We have provided links to Florida state resources in the right column of this announcement that we hope will help people make informed decisions about their travel plans. Gulf of Mexico Harmful Algal Bloom Forecast: NOAA’s Red Tide Bulletins are issued twice weekly during a red tide event. General information and resources about harmful algal blooms: NOAA portal with links to educational information about harmful algal blooms. Harmful Algal Bloom Detection and Resources: NOAA National Centers for Coastal Ocean Science projects, news, products, data, and general information related to harmful algal blooms. What is a red tide? 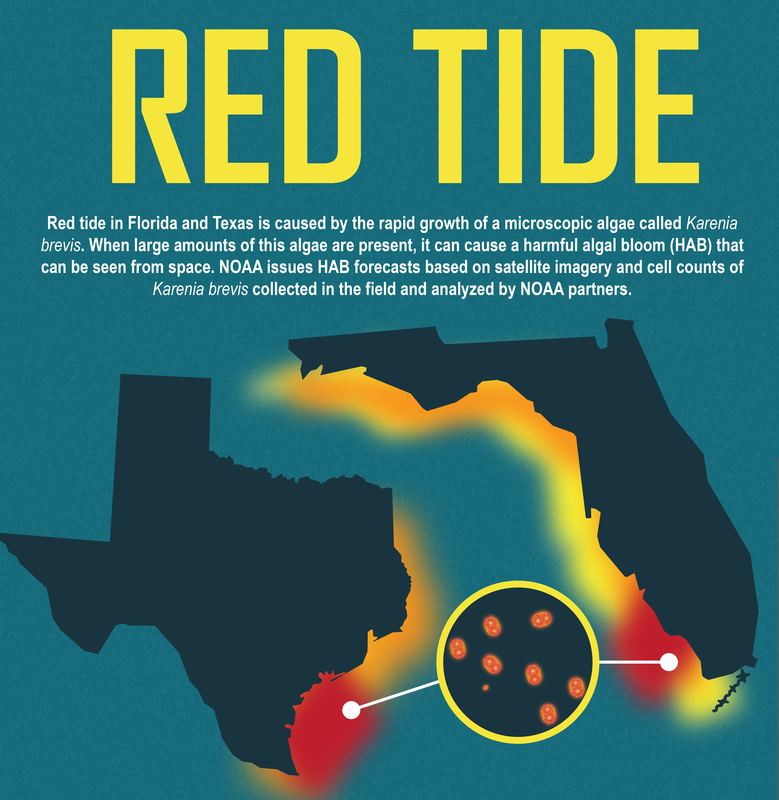 : View our infographics to learn about red tide and NOAA harmful algal bloom forecasting. Algal Bloom Monitoring and Support: Consolidated site from Florida Department of Environmental Protection portal for all Florida algal bloom resources. 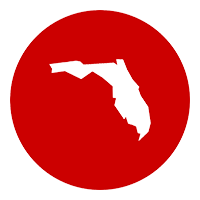 Aquatic Toxins: Poison Control Center: Resources on aquatic toxins, to include Florida red tide, from Florida’s Poison Control Center. Harmful algal blooms occur nearly every summer along the nation’s coasts. Often, the blooms turn the water a deep red. While many people call all such events “red tides,” scientists prefer the term harmful algal bloom or HAB. A red tide or HAB results from the rapid growth of microscopic algae. Some produce toxins that have harmful effects on people, fish, marine mammals, and birds. In Florida and Texas, this is primarily caused by the harmful algae species Karenia brevis. Red tide can result in varying levels of eye and respiratory irritation for people, which may be more severe for those with preexisting respiratory conditions (such as asthma). The blooms can also cause large fish kills and discolored water along the coast. How Does the NOAA Forecast Work? NOAA uses a combination of satellite imagery and water samples of the algae species Karenia brevis, collected from the field by local partners, to forecast the location and intensity of red tide events. Satellite imagery is a key tool for detecting blooms before they reach the coast, verifying bloom movement and forecasting potential respiratory irritation. The condition reports for red tide in Florida and Texas are available to the public and give the daily level of respiratory irritation forecasts by coastal region. NOAA also issues HAB bulletins that contain analyses of ocean color satellite imagery, field observations, models, public health reports, and buoy data. The bulletins also contain forecasts of potential Karenia brevis bloom transport, intensification, and associated respiratory irritation based on the analysis of information from partners and data providers. The bulletins are primarily issued to public health managers, natural resource managers, and scientists interested in HABs. A week after the the bulletin is issued, it is posted to the Bulletin Archive where the public can access it. Red Tide in Florida and Texas is caused by the rapid growth of a microscopic algae called Karenia brevis. When large amounts of this algae are present, it can cause a harmful algal bloom (HAB) that can be seen from space. NOAA issues HAB forecasts based on satellite imagery and cell counts of Karenia brevis collected in the field and analyzed by NOAA partners. Why should you care? Red Tide in Florida and Texas produces a toxin that can have harmful effects for marine life. For people, the toxin can become airborne and cause respiratory issues and eye irritation. These symptoms can be more severe for people with serious respiratory issues such as asthma. Making Choices. 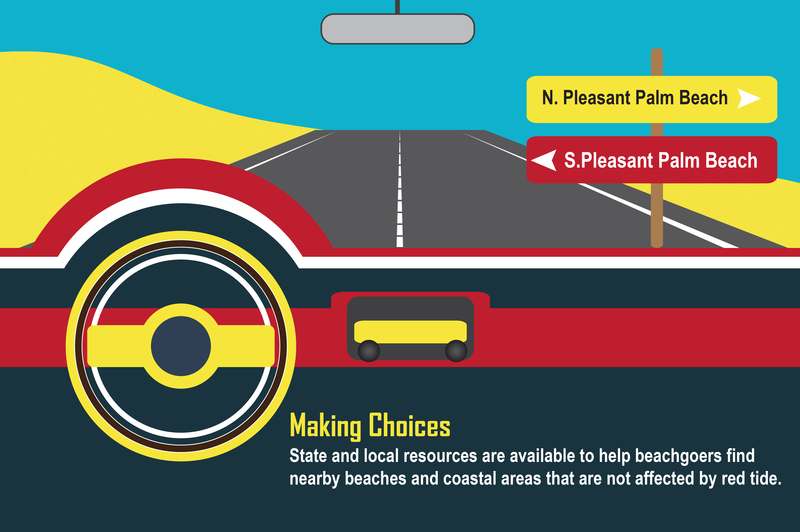 State and local resources are available to help beachgoers find beaches and coastal areas that are not impacted by Red Tide, but are still nearby. Close to 200,000 die each year from polluted water. Nearly 70 percent of India’s water is contaminated, impacting three in four Indians and contributing to 20 percent of the country’s disease burden. 21 major cities, including New Delhi and India’s IT hub of Bengaluru, will run out of groundwater by 2020, affecting 100 million people.